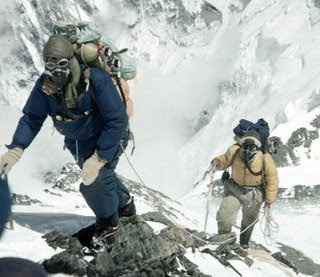 My handy news commentator informed me earlier that today is the anniversary of Sir Edmund Hillary's climb up Mount Everest. 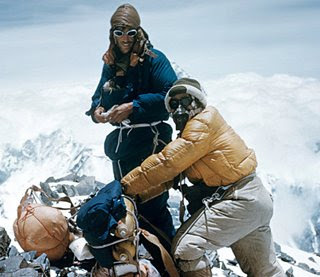 He was the first of the great explorers to do it and a pretty cool guy all around. Well, Rexie is gone and I'm a little sad. The yard feels empty without her, but I'm so happy that she's moved her babies. They were starting to get naughtier and the busy road was freaking me out. 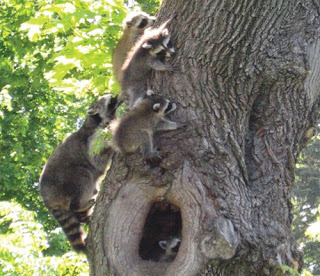 I'm sure she found a great new condo for them to live in (we all know her taste is quite swanky) and I'm hoping the kids at least sprung for a pedicure for her efforts. Who knows, maybe they'll come back for a visit some time? My neighbor thinks they've got the spot saved on Google Maps for next year - keep your fingers crossed! Most of you probably don't look at packaging design obsessively in the grocery store - in other words, you're saner than me! I can easily lose an hour or 2 when I'm just supposed to pick up bagels. Poor MG is very patient! 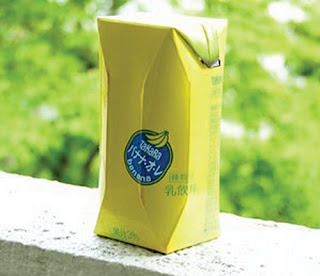 Recently I discovered some absolutely brilliant beverage packaging. My current favorite is Y Water for kids. 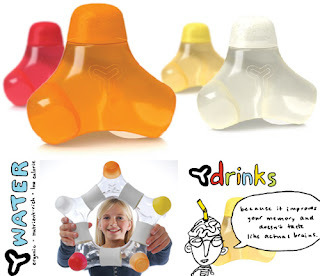 Not only is the drink organic and the bottle 100% recyclable, but the actual container shape is designed to inspire creativity in kids. When they're empty, the y-shaped bottles interlock and become a toy. Talk about fun, wish I'd thought of it! For more great packaging from around the world, this site is awesome. Even if you're not a designer, it could be inspiring and it may even change your next grocery trip. Happy shopping! If you haven't figured it out yet, I'm a big gardening nerd. No seriously, I am and I'm okay with it. Now I'm not growing anything as fancy as a Victory garden, but I am quite chuffed (that's South African for "proud/pleased/excited") about my little nook of flowers. 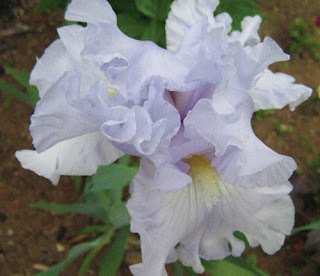 My latest obsession is irises. 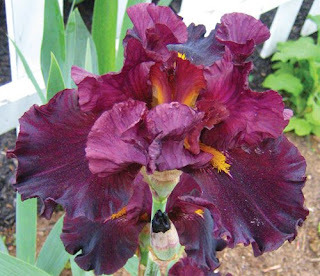 They come in so many amazing colors, plus they have fun names like "Bewilderbeast" and "Anvil of Darkness". 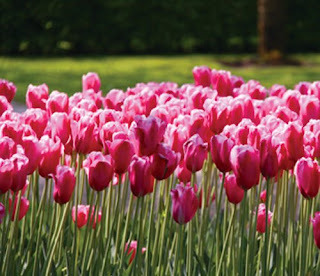 Even if you don't like flowers, the names are fun to check out. 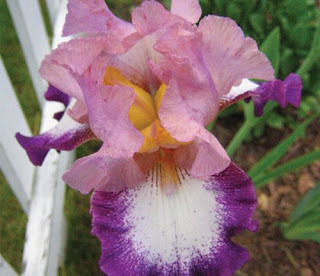 Last summer I was lucky enough to snag a bunch of "named" irises from an even more obsessed grower on etsy. After a year of waiting, they've finally bloomed! Talk about patience paying off and with very little effort. 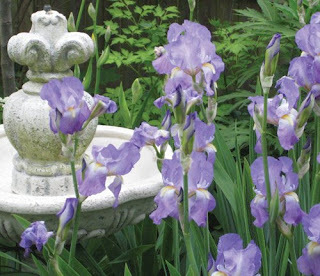 So, if you're looking for something different in your garden or flowers that make you look like you have more gardening skills than you do, give irises a try. They're sure to bring happiness and a bit of wow. Well ladies and gents, sorry for my absence but I have a good reason. I fell down the stairs a couple of weeks ago and have been paying for it since. Yes, I know I'm pregnant and that holding the hand rail is a good idea, but I wasn't paying attention cause I was too busy warning MG not to fall. Ahh...irony. The good news is that baby 2 is fine. Phew! The bad news is I herniated a disk and earned a hairline fracture in my leg. Not so much fun. 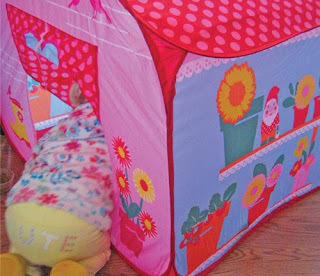 My parent's are back from their fabulous trip to Holland & Germany and they brought lots of goodies for MG. She's so very proud of her klompe slippers and the tent house from Hema is the ultimate in fun color. 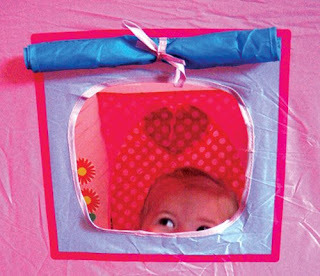 Plus it folds down to practically nothing! If you have a sec, check out their site, the design is amazing and I want to order everything! 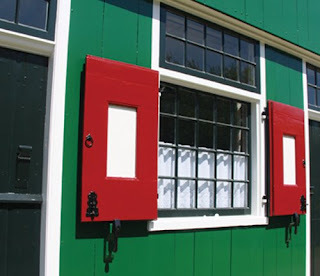 Makes me proud to be a little bit Dutch! Don't worry, not me - though I feel like I'm carrying at least 2 babies these days! I mean surely one baby can't move that much, right?! Anyway, given the huge response after the first post, I figured you may appreciate some news on our resident illegal aliens... Rexie and the triplets. 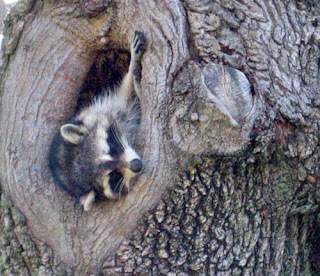 Every morning we open the window while we eat breakfast and she sticks her head out the tree to say hi (I'm NOT kidding). It's so cute and I'm way too attached. Seriously, look at the pic, you'll understand why! Wow, we're back to Friday again and that can only mean one thing besides YAY WEEKEND - it's Font Friday time! Since we're still technically in Mother's Day week, I've decided to feature a font that's near and dear to me, Marzipan. My dad designed it in honor of MG right after she was born. Yes, we do things slightly differently in my family! 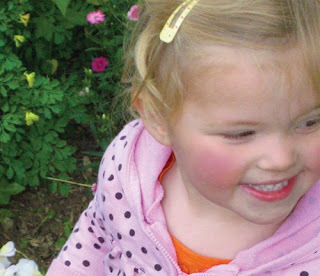 Just like my little girl, Marzipan has a sparkle to it along with a spontaneous flare and a bit of whimsy. 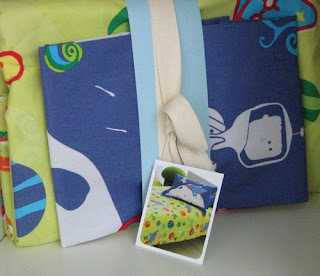 It's great for a multitude of applications including brochures, identities, packaging and scrapbooking. Hope it makes you smile! Most of you know that I'm not a big time cook. In fact, I mostly shine in the dessert category - if you count eating tons of them!! The only thing I do often, thanks to my South African roots, is celebrate tea time. You know, the real deal with a proper tea pot and a pretty tray with all the accessories. 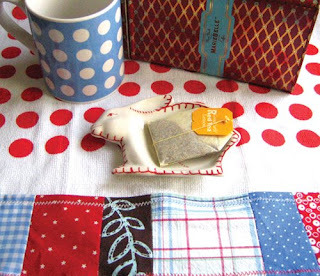 So this free pattern is tea time, Cath Kidston & Anthropologie inspired (I'm always drooling on their linens in the store, oops!). 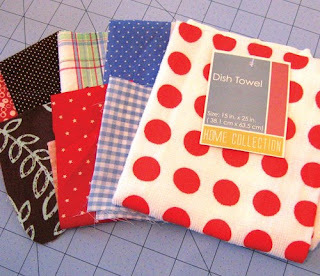 You can sew up a few quickly to add sparkle to your kitchen or for hostess gifts (wrap a box of nice tea with one & add a ribbon - pretty!). 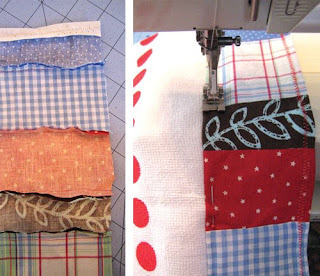 Ok, I admit there's some sewing involved with this, but trust me, it's minor... start by cutting your fabric scraps into rectangles. There's no right or wrong, just randomly cut. 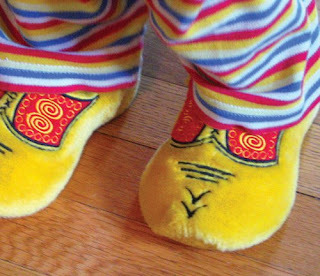 Sew them into a strip - keep adding until it's a 1/2" wider than your towel. Trim the strip so that the long edges are even. Fold over the short ends 1/4" and seam. Hem one of the long edges with a 1/4" fold over. Pin the strip to the bottom of your towel (right sides together) and stitch to attach. Flip the strip over and top stitch with a zig zag seam. Ta da - you're done! Now have a cup of tea, you've earned it!! I am bursting to share this tidbit with all of you - after lots of work, my good friend Paola is opening her children's store "Tickles" in downtown Bethel, CT. Seriously, I am so happy for her! 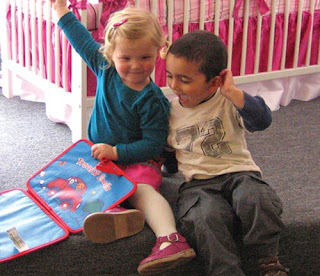 MG and I went for a pre-opening visit last week (see pic of MG with her buddy Lucas) and it's already got lots of great goodies. 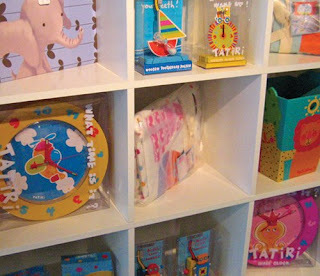 She's stocking items for babies through teens including Dwell Studio crib sets, colorful Tatiri products for fun gifts and beautiful bedroom decor. She's even been generous enough to stock some of my pinafores - thank you!! This is a short but sweet and most heartfelt post to all the mommas out there - HAPPY DAY TO YOU!! Hope you felt loved, appreciated and warm & fuzzy all over! Being a fellow mom, I'm sure you deserve it tenfold! "It's my FAVORITE blue skateboard!" After a solid 3 months of begging and lots of "practicing her cool moves" without one, I finally broke down and bought MG a skateboard. I know I'll probably regret it (especially after the first big tumble) but she's the happiest little girl ever. 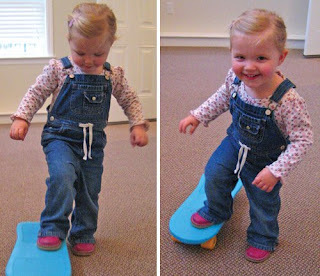 It's her "favorite blue skateboard" and she's going to "practice to be super fast". Plus, Uncle PJ is going to teach her "lots of awesome tricks". Yes, this may be regrettable, but it's really fun while it lasts! Ribbon is a dangerous business my friends. It has a way of wanting to be kept, regardless of having a purpose. Truthfully, I have tons of little ribbon scraps from all over creation bogging up my sewing boxes. 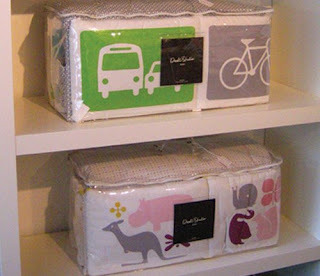 I know they should be sent packing, but I just want to own them. Yes, it's a problem. So, I've decided to make use of some with this little tutorial. 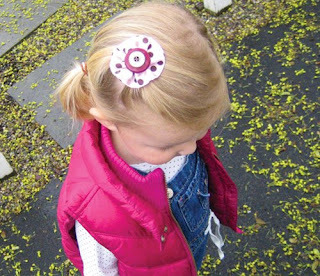 These hair clippies are quick, easy and could rival the expensive ones in children's boutiques. Trust me, you can make these!! Here goes... thread your needle & knot. 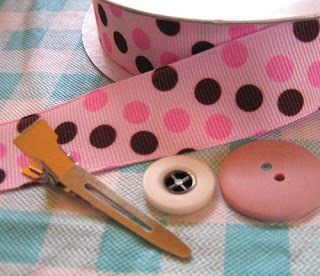 Starting on one end of the long side of your ribbon, sew a running stitch (looks like a line of dashes) all along the edge. 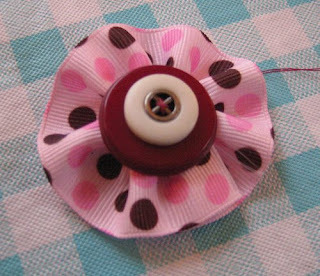 When you get to the end, pull the thread so that it gathers the ribbon into a flower. 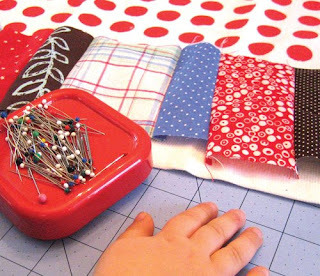 Sew a little stitch to hold it in place and knot. Don't cut the thread! 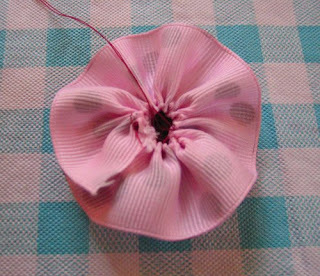 Now sew on the buttons using the same thread and knot to secure. 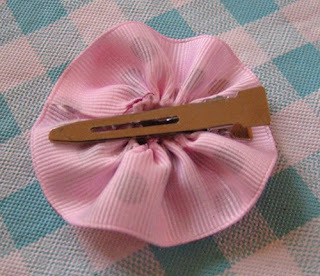 Glue the flower to the clip and ta da!! Your home ec. 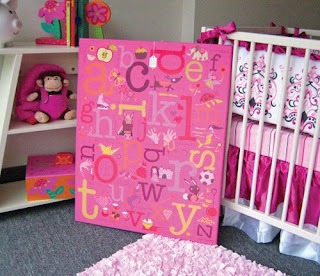 teacher would be proud and your little girl will be happily stylish! Big news everyone - we have a new addition to our family! No, not baby Newton 2, sorry to psych you out ... our new baby is a tad furrier than that (at least I hope so for 2's sake!). 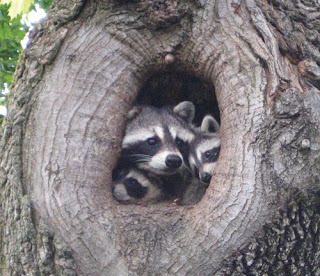 About a month ago we realized that a raccoon is camping out in our front tree. Since we live on a busy road and the neighbors dogs are nuts, we happily gave "Rexie" political asylum. Yeah, we're softies. In return, Rexie is nice enough to stick her head out and say hi whenever we're outside - I'm not kidding! So last weekend Rexie wasn't very chipper and I began to worry. 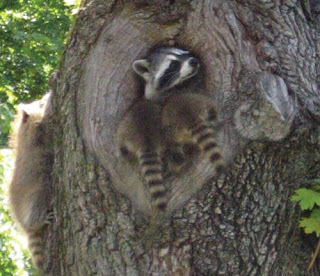 Have no fear, the poor thing was in labor and we now have the world's cutest raccoon baby ever - "Roxie". Seriously, it's insanely cute. Every morning we open the window and Rexie says hi and the baby tries to sneak by her. It's like Animal Planet but 20 feet away, really cool! I've realized that she's just as loving and tired as people mommies and I'm so proud of her. What can I say, they just make me happy.